Orson became aware of Simon Ballard when he asked himself the following question: What kind of drug could he produce that every civilized person in the world would buy and continue to buy, whether they needed it or not? In House Blood, Joe DeMarco, a legal investigator on the staff of former Speaker of the House John Mahoney, is asked to look into the murder conviction of a former lobbyist. His heart isn’t really in it, but when he starts reviewing the case, he discovers a pharmaceutical company has been testing a new unknown drug on humans in different parts of the world and the company has been using natural disasters to hide what they are doing. As the investigation continues, DeMarco becomes the target of two assassins and must figure out how to stop them before he becomes their latest victim. It was rather like the first folks who decided man could fly. It appeared reasonable to some that gluing feathers to their bodies and flapping their arms like wings might work. It worked for birds, why not for humans? After some daring person tested this particular theory – and ended up broken and bloody at the bottom of a cliff – other theories were developed. Such was the case with Ballard’s drug – until it was actually tested on human beings, he couldn’t be sure it would fly. I spent most of the summer reading new-to-me authors, and Mike Lawson is definitely one of my new favorites. In fact, I’m a little mad at myself that I haven’t discovered him before now. Lawson’s main character, Joe DeMarco is the most reluctant hero I’ve ever met in a book. But he is funny and completely self-aware about his laziness, so his reluctance is easily forgivable. And in the end, he really comes through, which is what matters most. “No,” DeMarco said – and he wasn’t being self-righteous. That was the truth. One of the more fascinating aspects of this novel, at least for me, are the different perspectives Lawson wrote from and how that helped me to connect with each character. In many thrillers, the story is centrally told from one major characters’ perspective or it’s narrated. Sometimes you get 2 or 3 perspectives, but that’s it. In House Blood, you get a peek into the mind of nearly every character, which adds so many different layers to this story that it’s impossible to not care about most of them at least a little bit – even the bad guys. Which has sparked an internal debate in my head about the varying degrees of good and evil. There are plenty of evil characters in House Blood, but two of them, Kelly and Nelson, are more victims of their circumstances than truly at-their-core evil. I can’t say the same for the other villains, but I spent many pages hoping against hope that Kelly and Nelson would ultimately find redemption. 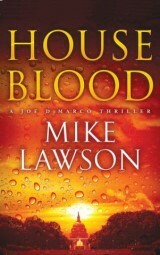 House Blood is Book 7 in the Joe DeMarco Series. There were a few times where I think reading the beginning of the series would have been very helpful for background information, but overall, I could easily follow the characters and figure out their history without too much guess-work. I gave House Blood 4 out of 5 Sunshines. Mike Lawson is now on my list of must-read authors, and I’m looking forward to the release of his next thriller!